The Elm House Hotel is centrally situated in the old town of Hawick and is an ideal base from which to tour the Scottish Borders. This popular hotel is under the personal supervision of the Redpath Family who guarantee a warm, friendly atmosphere, comfortable rooms and excellent cuisine. 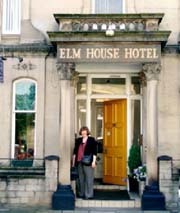 The Elm House Hotel assures you of a comfortable stay with top quality food and service at competitive prices. Lovely scenery and many interesting things to do will make your holiday in the Scottish Borders a memorable one. Elm House Hotel can caterer with the single visitor through to a small party offering single, twin, double, triple and a family room. We also have two twin rooms designed with the needs of guests with disability. All rooms have television and tea-making facilities. All have a private bathroom or shower. Under the new ownership of the Redpath Family there has been an ongoing programme of re-decoration so all the rooms are fresh, bright and comfortable. We can offer our guests a Bed & Breakfast package or Dinner Bed & Breakfast. Guests can also enjoy a full lunchtime menu, all the meals prepared by our respected chefs. The hotel is also open to non residents and it is a popular venue for the locals. Relax in our pleasant Lounge or Cocktail Bar then enjoy a superb meal in our excellent licensed Dining Room. The Dining Room is also popular with local people because of the high standard of service and the wide variety of food on offer. Choose a full meal from our comprehensive menu or try one of our Bar Lunch "Specials".